PFC Warren Boes blasts away at a mock enemy headquarters on Fergusson Island. Jan 1944. 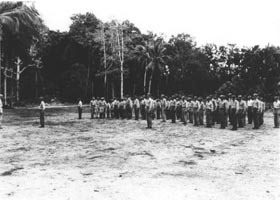 Staff and selected candidates of the 1st Alamo Scouts Training Class. 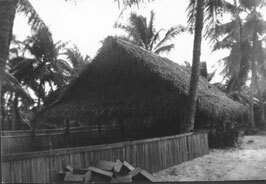 Fegusson Island, N.G., December 1943. 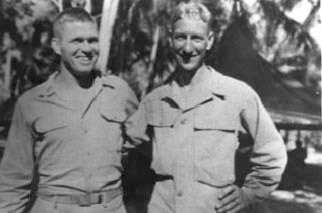 John Dove and Lew Hochstrasser. 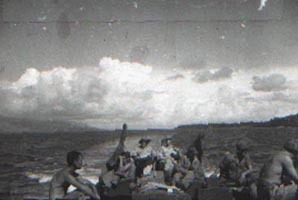 New Guinea, Summer 1944. 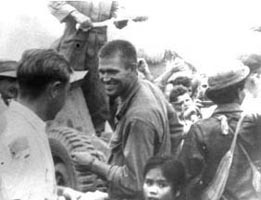 John Dove hands out candy and cigarettes to POWs following the Cabanatuan prison camp liberation. 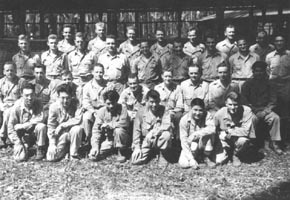 Luzon, P.I., Jan 1945. 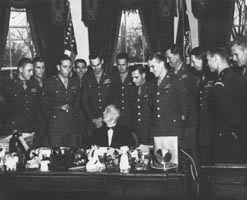 Alamo Scouts Harold Hard (5th from the left) and Gilbert Cox (far right), along with selected Rangers, meet with President Roosevelt following the Cabanatuan liberation. Mar 1945. 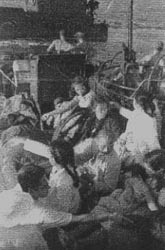 Civilians liberated from the Japanese on Fuga Island, board PT-379. July 1945. 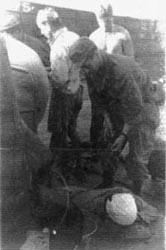 Unidentified Scout secures a Japanese prisoner. Fuga Island. July 1945. 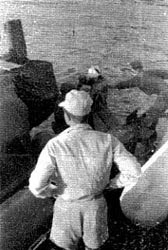 PT Boat skipper Robert Morton observes transfer of POWs from PT-379. Fuga Island. July 1945. Graduation ceremony of the 5th training class at Hollandia, D.N.G. 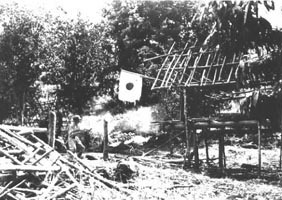 28 Oct 1944. THOMPSON TEAM aboard a PT boat en route to a mission. New Guinea. 1944. 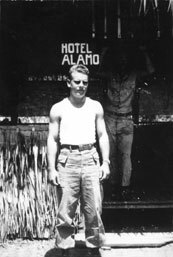 1LT John R.C. McGowen, 1945. 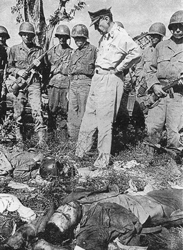 Alamo Scout Galen Kittleson (far right) on special assignment with General Douglas MacArthur at Bataan, Luzon, P.I. 1945. LITTLEFIELD TEAM graduation photo, Mange Point, Finschaven	Area, N.G. June 1944. Back row L-R: Samuel L. Armstrong,	Alva C. Branson, Elmer E. Niemela. Front row L-R: Zeke McConnell, Paul G. Bemish, Allen H. Throgmorton. Wilbur F. Littlefield not pictured. 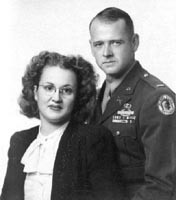 William E. Nellist & wife Jane, 1945. 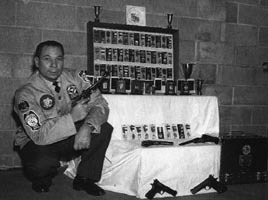 Major Homer Red Williams, 2d Director of Training, N.G. 1944. 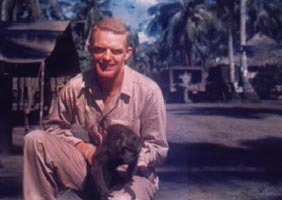 Red Williams, New Guinea. 1944.